Gerrit Berckheyde – Frans Hals Museum. 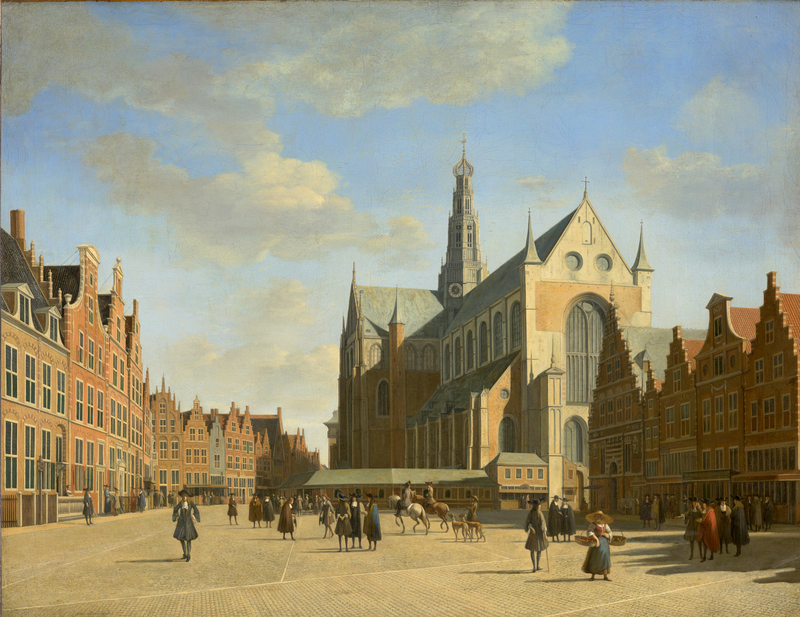 Title: The Grote Markt in Haarlem with the Grote or St. Bavokerk, seen from the West. Date: 1696. Materials: oil on canvas. Dimensions: 69.5 x 90.5 cm.. Source: ? I have changed the light and contrast of the original photo. An Italianate landscape, centring on the ruins of a tall, classical Roman edifice, described as a tomb. Reliefs on this building include a figure on a throne and a horseman. The landscape is populated with various human figures, some of whom travel in a rowing boat along the river in the foreground. Vroom himself had most probably never been to Italy. He is likely to have drawn his inspiration from the work of colleagues, particularly Adam Elsheimer and Jan van de Velde. His ignorance of things Italian might explain the presence of some very Dutch-looking plants and trees, and the typically Dutch motif of the woman knocking acorns out of a tree for her pigs (http://fhm.imagedatabase.nl/imagebank/description.asp?image_id=772). A small early work by the most famous landscape painter of the Golden Age. Jacob van Ruisdael probably painted it when he was in his early twenties. The size and the way in which the clouds and the chiaroscuro are handled make it very similar to other early work by the painter. It shows a dune landscape near Haarlem, a subject that was also popular with other painters of the period. On the left is a hunter with a dog, hunting a rabbit. In the centre foreground, a red-coated man on a horse creates a subtle contrasting accent against the green. Behind him are some buildings and a little windmill. The sea can just be glimpsed on the horizon. Jacob borrowed one of his uncle Salomon’s tricks to suggest depth: a bank of cloud running diagonally (http://fhm.imagedatabase.nl/imagebank/description.asp?image_id=705).